Lelant is a village at the estuary of the River Hayle and it was a sea port in medieval times, though exactly where the port was or what it was is unknown, and later there were at times several different quays for boats. Six quays can be identified: Norwaymans Quay, Clay Quay, Dynamite Quay, Brewery Quay, and two quays at Griggs. A possible seventh and even eighth quay is by the railway station. The quays are known by a variety of names and the word wharf is often used in place of quay and sometimes the plural quays or wharfs or wharves is used for an individual quay. The 1839 tithe map of Lelant (CRO 1839) marks "Norwaymans Dock" to the southeast of where the path from the church reaches the ferry beach, between the ferry (though that is not marked on the map) and the present Dynamite Quay. It was here that ships from Scandinavia (hence the name) probably unloaded timber. Written in the back of the reference book of the Survey of the manor of Lelant and Trevethow (RIC 1838) is an item about tolls payable to Praed/Tyringham on goods landed at "Norwaymans Quay on the River, Lelant." The book is dated 1838 like the copy-maps it accompanies and this entry is probably of that date too. A lease of 1771 and 1785 refers to the right to build a "dock." It places it "under Lelant church" and could refer to Norwaymans Dock (CRO X/473/97). A lease of 1794 refers specifically to "the dock called Norwayman's Dock" (CRO X/473/100) which shows that it was in existence by then. The lease also refers to the right to land and place timber on the beach. Several maps of proposals for a railway line from St Erth to St Ives include a spur to Clay Quay: CRO QS/PDR/14/5 (year 1852), QS/PDR/14/6,7 (1860), and QS/PDR/14, 8,9 (1863). This quay was in the vicinity of the present Dynamite Quay. When it was built is unknown but its name suggests that it was used to transport clay from Lelant probably to South Wales (see Work in Lelant). When and how it disappeared is also unknown. The 1839 tithe map of Lelant shows an unnamed "Quay" around the site of the present Dynamite Quay. There is a reference to Old Clay Quay in the 1841 census for Lelant. George Gregory is living with his family at Old Clay Quay, Quay Lane, Lelant. He is aged fifty (rounded up in this census) and no occupation recorded for him so it is not possible to know if he worked at the quay. The present demotic name comes from its use in World War II by the firm of Bickford Smith which became part of ICI. The quay was very busy then with boats loading fuses for explosives and unloading coal. The metal skeleton of the warehouse is still there. It has also been known as Lelant Wharf, Trevethoe Quays, Praed's Wharfs, and Lelant Quays. In Farr (1975) it is called Ordnance Quay and in the CAU report (2000, item 329) it is called Lelant Towans Wharf. The present granite quay was built in the 1870s as the branch railway through Lelant was building. In 1877 a spur railway was built from Lelant station to the quay and, although it has been removed, its line can still be traced. On the 1877 OS map it runs to the far northwest end of the quay. On the 1908 OS map the line from Lelant station is broken by Pedn Cruk but still runs to the northwest end of the quay. The 1936 OS map shows the line running only along the quay. The quay remains a substantial and intact quay today although some stone work is in need of repair. The quay is about 180 metres or more long. Ships drawing seventeen foot of water could use it at full tide (Bennett 1960, 35-36). A new approach road was built at the same time and still exists as a wide, unmetalled track. The Cornish Telegraph reported on 11 March 1873: "The quay, which is now in the course of erection at Lelant, is progressing favourably. About sixty men are employed on the works, and it is thought that when complete it will result in an influx of trade to Hayle as well as to Lelant." A further report appeared in the newspaper on 7 October 1874 and the West Briton of 18 January 1877 reported that the new quay was now open, waiitng for the completion of the railway, and that coal and other goods were already being unloaded there. There is a record of an incidence there: "An accident occurred at Lelant Quay on Thursday. A horse, attached to a cart belonging to WB Gilbart, coal merchant, backed over the quay and fell twenty feet. The young man in charge was hurled into the river but was all right. The horse had to be shot (St Ives Weekly Summary 15 March 1902). The quay was part of the sale of property by RWG Tyringham and the 1920 Trevethoe sale book says the quay, which it calls Lelant Wharf, includes a coal yard let to WB Gilbert, a Lelant coal merchant, and a weighbridge let to Thomas Pomeroy, the ferryman. Tyringham sold the quay to the shipbreaking firm of Thomas W Ward for £2800 and ships were dismantled here. A right of way on the approach road and the quay is disputed: see To the barricades! Well, perhaps not below. In 1982 blue asbestos was found and removed from the quay. It is possible that hereabouts there was a historic quay for Lelant, perhaps the medieval port (Todd and Laws 1972, 232). 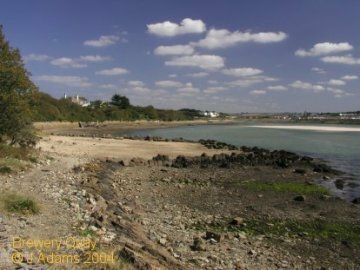 The CAU report (2000, item 329) suggests that rubble and scoria at the southestern end of the quay might be evidence of the remains of an earlier quay. The remnants of this can still be seen (see photograph), and this is possibly the site of an ancient landing place. The 1908 OS map calls it Old Quay and Noall (1960) calls it Old Lelant Quay, CAU (2000, item 624) call it Green Lane Quay. This quay is shown unnamed on the 1838 Moody/Rutger map (item 245) as part of "Lelant Cellars" and on the 1839 tithe map (item 1057). The quay served the brewery that used to be here and much more is known about that than the quay. The river was presumably deeper here then than now. The brewery seems to have ceased before the building of the branch railway line and the quay probably declined as a result. The railway line cut off the quay from the road and it fell into disuse. The area at the quay was the scene of a rescue on 2 September 1875. "On Thursday evening a youth named Alfred GALL was bathing at the Old Brewery Quay when, in endeavouring to stem the strong current which was running, he got exhausted and had twice sunk. A lad Charles HAWES, seeing the peril, without waiting to divest himself of his clothes, gallantly plunged into the rescue and succeeded in bringing Gall safely to the bank" (Cornish Telegraph 8 September 1875). There are leases which refer to quays already built or to be built in this area. The wording, though precise, does not enable them to be placed exactly and they could refer to Brewery Quay or one by the railway station (see below). They are CRO X/473/91 dated 1756 and CRO X/473/94 dated 1779. A lease of 1794 (CRO X/473/100) refers specifically to "Newton's Quay" and the imprecise location could be around Brewery Quay. These are two former quays at the southern end of Lelant Water. Their names are disputed. On the map accompanying the 1920 Trevethoe sale book the western quay is named as Harvey's and the eastern as Griggs. However, on the 1908 and 1936 OS maps the western quay is named as Griggs and the eastern quay is unnamed. The 1877 OS gives no names for either. The CAU report calls both quays Griggs Quay (2000, item 615). It says that the eastern quay was probably built in the late eighteenth century and the western was probably built in the late eighteenth or early nineteen century. A lease dated 1786 refers to a "newly-erected" quay near Grigg's land (CRO X/473/98), presumably the eastern quay. A lease dated 1775 perhaps refers to the right to build a quay here (CRO X/473/92). The eastern quay is now used partly as a car park for the Old Quay House public house and the western quay has a private house and business on it. The former water between the quays is filled in. Quays at the railway station? Just south of Lelant railway station is a narrow rubble projection, not shaped like a quay. The CAU report (2000, item 623) suggests that this might have been a quay or hard and calls it Station Hill Quay. It was at the start of the right of way cart track over the sands of Lelant Water (see Crossing the estuary and Lelant parish council). The only historic reference to a quay here, rather than a slipway to the track, is the map accompanying the 1838 survey (RIC). On this an "Old Quay" is marked as item 233 at the end of Quay Lane (now called Station Hill) and as part of "Lelant Old Cellars" which are not shown. The marked position of the "Lelant Old Cellars" quay is slightly to the north of the present slipway. This map shows Brewery Quay separately. It looks as though the "Lelant Old Cellars" quay was a forerunner of Brewery Quay on a slightly different site. It is possible that the leases mentioned under Brewery Quay refer to this one. This quay is not marked on the tithe map (though Brewery Quay is) which suggests that by 1839 the quay and any associated works had all but vanished. BENNETT Alan (1988) The Great Western Railway in Cornwall Runpast Press, Cheltenham (35-36). BOASE George Clement (1890) Collectanea Cornubiensis Netherton and Worth, Truro "Quay. Proposal by Winthrop M PRAED and George Edward MARTIN to make bye laws and levy rates at Lelant quays. cf Report by Board of Trade on proceedings under Piers Act 1861. Lond 1877, fol Parl papers 1877, vol lxxiii, 565" (page 1410). CAU Hayle historical assessment (Appendix 3: Inventory) Nick CAHILL and CAU, Truro. Cornwall Record Office: leases as referred to in the text. FARR Grahame E (1975) The ship registers of the port of Hayle National Maritime Museum, Greenwich. Newspapers: as referred to in the text. NOALL Cyril (1960) 'The old harbour and Brewery Quay of Lelant' in St Ives Times and Echo 12 February 1960. His discussion of the quays reflects the work of RM Nance. Survey of the manor of Lelant and Trevethow Royal Institution of Cornwall (RIC HJ/5/4). These are a book of maps by I. Rutger made in 1823 (copies of originals by Charles Moody in1820) and a reference book, probably dated 1838, of the property and lands of the estate. Tithe map of Lelant parish (1839). Map and reference book. Copy CRO, Truro (CRO AD 867/2) and fiche copy at Cornish Studies Library, Redruth. TODD AC and LAWS Peter (1972) Industrial archaeology of Cornwall David and Charles, Newton Abbott . Trevethoe estate sale reference book and maps (1920). Copy at CRO, Truro (CRO AD/813/9-11 and AD/768). There was a debate in 2002 about a right of way for people down the approach road and across the dramatically named Dynamite Quay is a rerun of a row that simmered during the 1920s. This is an account of the earlier dispute but let me warn you, however, that, although this lies on the edge of living memory, it is a tangled tale, the records are imperfect, there is much assertion, and there is no sure conclusion. In 1920 the Tyringham estate sold off much of its property in Lelant, virtually all the houses and the prosaically named "Lelant Wharf with approach road," this latter including the site of a coal yard let to WB Gilbart and a weighbridge house let to Thomas Pomeroy. Demotically, the wharf or quay was often in the past referred to as plural, Lelant quays. Since the Second World War it is usually called Dynamite Quay. The sale document makes it clear that RWG Tyringham, the then owner, considered there was not a right of way for the general public. The new owners of the quay were Thomas W Ward, a well-established company that dismantled ships at several places in Britain and which had bought the quay at Lelant for £2800. It was in effect a recycling operation. Within two years there was a furious debate in the village about the question of a right of way. Presumably the new owners had blocked off the route to stop the public from using it. The parish council and villagers were adamant: farmers had the right to go along it to the beach to get sand and people had used the route for years without hindrance and that made it a right. At the same time a row was developing about a right of way along the Saltings to the railway station, what is now the metalled public road but was then a track of indeterminate status (Cornishman 6 September 1922). In April 1922 the parish council had its first debate about the contended right of way at the quay (Lelant Parish Council Minute Book). It badgered the rural district council. In September the parish council learned that the district council had written to the new owners, Wards, to say it thought there was no right of way. The parish council responded by declaring that "there had been a right of way before the quay was built" (Cornishman 6 September 1922). It had letters from villagers who had used the route for many years. A brief article in the Cornishman of 13 September that year gives an account of the village side of the case. I have put in brackets some glosses to help us find our way through the tangle. "When the St Ives line was built, an old roadway to the beach was closed and superseded by the road of which the railway bridge forms a part [this is the broken-surfaced approach road which was built about 1876 and at that time was called a cart road]. That road was used by the public going to the ferry; together with a path across the green below the ferry bridge connecting with this road. Up to the time the Trevethoe quays [Dynamite Quay] and land changed hands , farmers drove to the beach for sand and others used the road to the ferry. According to the Trevethoe Estate, the taking of sand was a concession to tenants [villagers living in houses owned by Tyringham, practically everyone in Lelant before the 1920 sale] and farmers; but according to the local inhabitants and general public there was constant and uninterrupted usage. The closure and prohibition was only made by Messrs Ward and Co, the new owners. The activities of Messrs Ward and Co in employing labour and utilising the quays which have long been idle is recognised as a welcome and desirable thing; but residents of Lelant and visitors are astonished that they can be shut off by new barricades from the quays and ferry." The issue rumbled on with nothing being resolved. The next year, 1923, a petition was put up in the post office and sent to the county council in support the right of way (Lelant Parish Council Minute Book, August and September). Nothing was resolved. Then in 1925 the question broke out again. I am not clear whether this was the same closure or a new one by the owners. On 22 July 1925 the Cornishman reported, "The closing of the road to the beach by Wards, who occupy a wharf there for the purpose of breaking up old warships, has aroused considerable indignation." In 2002 the local newspapers were reporting similar anger about a closure. In 1925 county councillors came down to see the obstructed route for themselves and met some local residents at the site. The county passed the question back to the district council. Because the farmers' right to go and get sand was affected by the closure, the farmers' union was asked for help. "Mr Harry stated that when the county council committee visited Lelant, one of the members advised the parishioners to pull the obstruction down; he had said the people of Lelant were too slow (Hear, hear)." "This council is strongly of the opinion that the public have a right of way over the Lelant Quay and can produce living evidence to prove that it has been used for over seventy years without interference." As far as I can see, it fizzled out though people did at some undetermined point begin to use the route again. Nothing was resolved, and that's why, seventy six years later, we had Groundhog Day at Dynamite Quay and debated again whether people can freely pass along the approach road, over the wharf, and on to the beach. In 2002 there was at Merseyside Maritime Museum an exhibition of the shipbreaking work in Lancashire of Thomas W Ward.